With a stay at The Botany Bay Hotel in Broadstairs, you'll be next to a golf course and minutes from Botany Bay and close to Dreamland. This golf hotel is within close proximity of Kingsgate Bay and Joss Bay. Stay in one of 30 guestrooms featuring flat-screen televisions. Complimentary wireless Internet access is available to keep you connected. Private bathrooms with bathtubs or showers feature complimentary toiletries and hair dryers. Conveniences include phones and coffee/tea makers, and you can also request cribs/infant beds (complimentary). Grab a bite to eat at the hotel's restaurant, which features a bar, or stay in and take advantage of room service (during limited hours). Quench your thirst with your favorite drink at a bar/lounge. For your convenience, a complimentary breakfast is served daily from 7:30 AM to 9 AM. The front desk is staffed during limited hours. Event facilities at this hotel consist of a conference center and meeting rooms. Free self parking is available onsite. 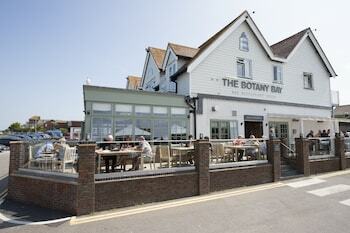 Botany Bay Hotel is an amazing Broadstairs lodging choice for your trip to United Kingdom. With numerous amenities for guests such as lounge/bar, you will wake up at Botany Bay Hotel feeling ready to go every day for your time in Broadstairs. Don’t let this amazing reservation opportunity pass you by, book your stay at Botany Bay Hotel today to make the most of your time in Broadstairs, United Kingdom.